Economical and optically clear polystyrene petri dish provides quality sample viewing without distortion. Tight lids prevent excess evaporation. A convenient 3-tab design on the lid provides secure handling for tissue culture use. Packaged in sleeves of 20, sterile. The polystyrene Contact Plate contains a 10 x 10 alphanumeric grid for use in cell location and orientation. These sterile contact plates are free from optical distortion. The cost saving design of the convex bottom contact plate (Product #14016) lessens the amount of tissue culture medium necessary. 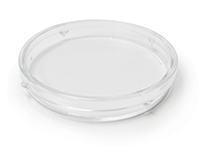 The polystyrene 50 x 9mm petri dish is ideal for tissue culture work. The petri dishes are stackable with squared off edges providing an easy grip surface for single handed opening. Tight fitting lids prevent excessive drying of the absorbent pad or culture media during incubation. A convenient frosted area on the lid enables labeling for safety and consistency. Available with or without 47mm membrane filter pad. sterilized in packages of 20, 100 or case of 500. Outside dimensions: 100mm dia. x 15mm H; inside dimensions: 88mm dia. x 12mm H (with lid on). Size: 100 x 100 x 15mm high. Polypropylene Petri Dishes are microwave transparent and sturdy. These dishes can be coupled with the PELCO Prep-Eze holders for microwave processing. Specialty	size	for	use with McIlwain Tissue Chopper, but excellent for general laboratory use. Bottom outside dia. 60mm x 13.7mm height; Top outside dia. 63mm x 8.5mm height. 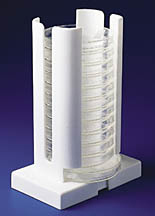 This adjustable dispenser neatly and safely holds 15 petri dishes up to 10cm (4") in diameter. Made of rugged ABS plastic, it slides apart at the base for easy refilling. The rack is 21cm (8-1/4") high x 9cm (3-1/2") wide and extends from 13cm (5") to 21cm (8-1/4") long.